DC in the 80s was incredibly lucky to have Tom Veitch's notes on the issues he wrote of Animal Man v1 back in the early 90s (issues #33 - #50). 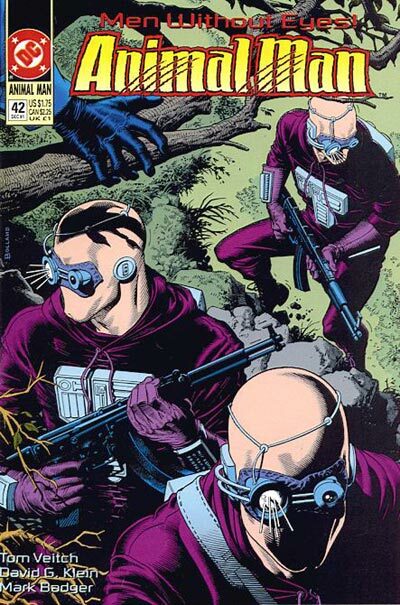 For your viewing pleasure, we've also included the cover of the issues (all covers illustrated by Brain Bolland). #33: "I am the man of deep ungodly powers!" 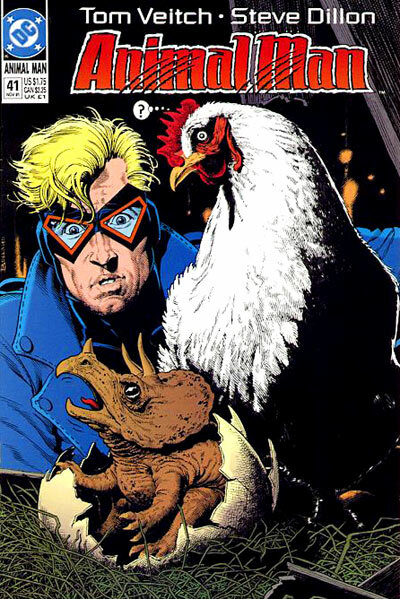 Awakened from his Pete Milligan-induced coma, Animal Man is restored to status quo – he’s Animal Man with the family and the job as a stuntman. However his powers are not working as they should. And Maxine is acting rather feral. 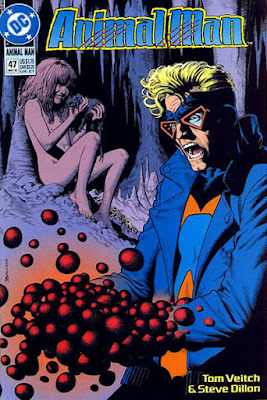 We also begin to realize that there is a shamanistic/mystical element to Animal Man’s powers – a connection to a Native American shaman living in a house trailer. 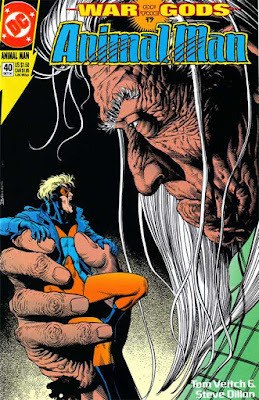 Apparently this old Indian gives Animal Man his animal powers by connecting him to the Morphogenic field (the M-field) from which all animal instinct and power comes from. #34: "Requiem for a Bird of Prey"
Maxine, because of her connection to her father, is also connected with the M-field. And when her dad feels aggressive animal instincts, she shares them, growling like an animal and tearing her toys apart with her teeth. 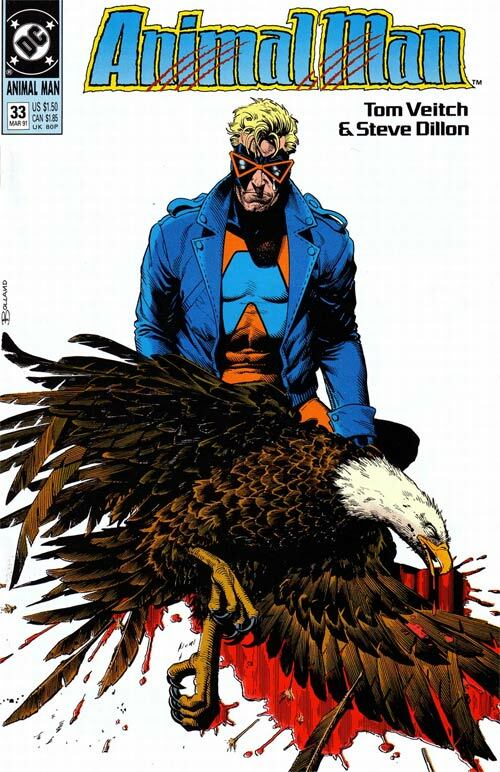 Animal Man finally realizes that his powers are not under control and he is hurting living things – when he flies, birds of prey mysteriously die. TRAVIS: Ever hear of the morphogenetic field? 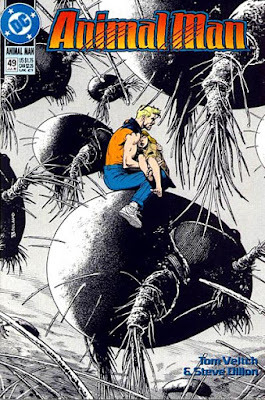 ANIMAL MAN: Uh … yeah. TRAVIS: Of course you have … Sheldrakes’ theory. Animal essences, modalities, genetic templates … all meshing over a great vat of life energy. …It’s like earth is one big animal … and you and me are like leeches on the big animal, ya dig? 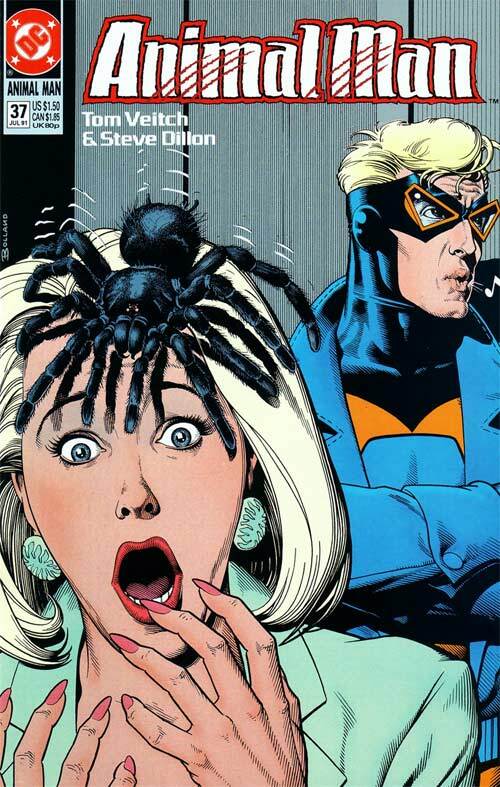 ANIMAL MAN: Uh…yeah. I…uh…dig. … Somebody once explained Sheldrake’s theory to me. I accept it … but it’s just a theory … I mean, theories are nice, but I work with feelings and energies I can sense. There’s no words involved in what I do. TRAVIS: I’m hip to that. I have super powers myself, ya know? TRAVIS: Have you ever asked yourself this? 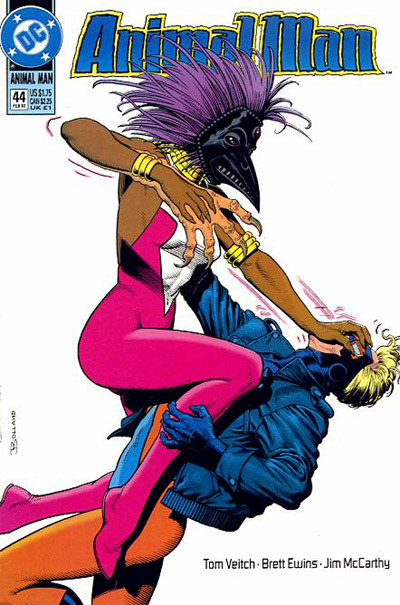 How come the birds use aerodynamic wings to fly, but Animal Man flies without lifting a finger? What’s this so-called “bird power” you talk about? The birds don’t have it! The poor creatures have to flap their wings! ANIMAL MAN: Uh … you’ve got a point. TRAVIS: Damn right I do … Now who’s the smartest, me or you? #36: "The Call of the Wild"
TRAVIS: "You're going to be the most powerful being on the planet." 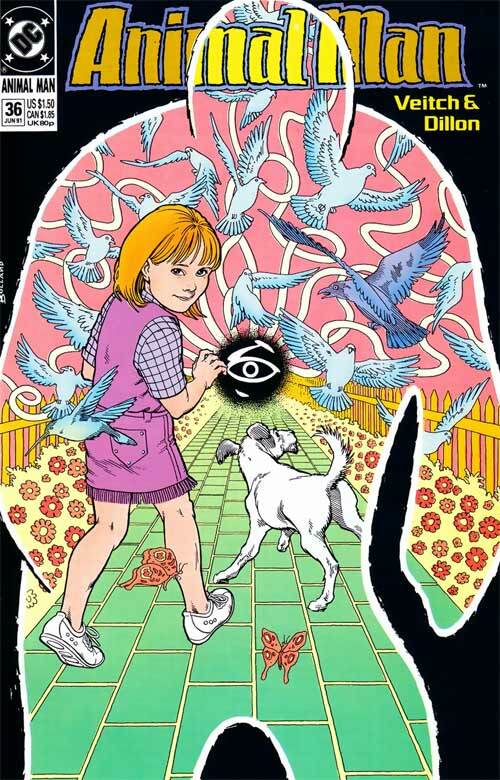 Animal Man adds unusual powers by focusing on different animals. (I did a lot of research on animals at this time.) So, for instance, by focusing on a lizard that shoots venom from its skin, Animal Man can shoot powerful toxin from his hands. Then he buys a van “to carry all the special animals I’ll be taking with me on jobs.” Meanwhile Travis is initiated by “Mr. Rainbow” – the old shaman’s mystic messenger. #37: "The Zoo At World’s End"
But the old Shaman has other ideas for Animal Man. He breaks the clay Animal Man statue with a hammer, and Buddy gets a huge influx of M-Field energy … which unfortunately kills every animal in the San Diego Zoo! 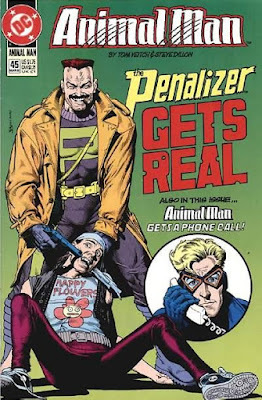 A comic book within a comic book, Penalizer is introduced. 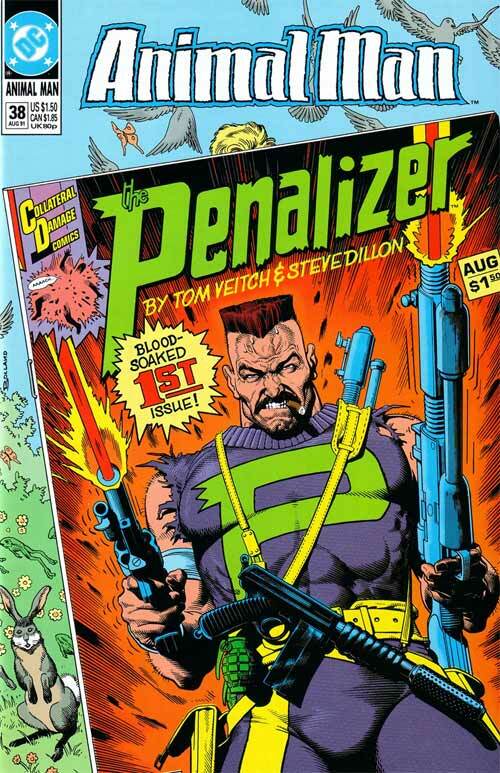 This is Cliff’s favorite comic, and it’s a parody of Marvel’s Punisher. I was told the editor of Punisher taped the cover of Penalizer to his office door! Meanwhile Travis has a wild theory he has been “contacted by angels” and there’s a giant starship buried somewhere in upstate New York. He believes that after he finds and boards the starship, the end of the world will begin! 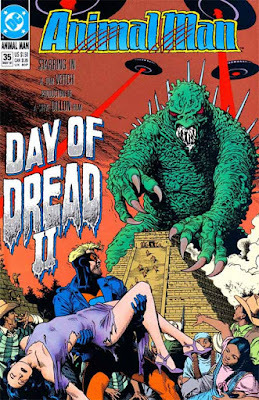 Issue climaxes with a battle between Animal Man and Mr. Rainbow, who takes the form of a monster. Travis arrives at the old shaman’s trailer in upstate N.Y. Meanwhile wolves attack the San Diego Comicbook Convention. 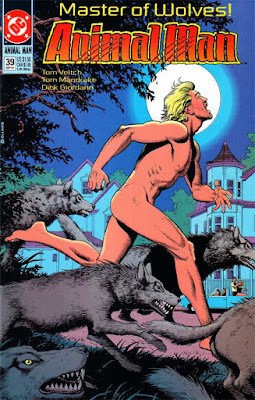 And Animal Man rips off his clothes and runs with the wolves through San Diego. #41: "The Stone That Cracked Open the Earth Like An Egg"
-One, I was getting a better internal sense of the characters. -Two, we were getting tremendous positive feedback from the readers. -And three, I was learning a lot from watching David Lynch’s Twin Peaks show. Lynch knows how to tell a character-driven story. As a writer, he helps you break the old story-telling patterns that Hollywood (and comics) have burned into your brain since you were a kid. A good action story involving genetic clones who are fitted with cyborg brains. Also introduced “the knacker man”, a guy who collects roadkills and dead farm animals and sells them to the gene lab. Last but by no means least, Animal Man takes the form of a bear. In the next issue he will mate with a young shamaness who also takes the form of a bear. #43: "Tiger, Tiger, Burning Bright"
#44: "Who Is That Masked Woman?" "The Beat of Darkness" in which we learn that Les Decker, writer-editor of Penalizer Comics, is a crime fighter who puts on a Penalizer costume and hunts down drug dealers and such. 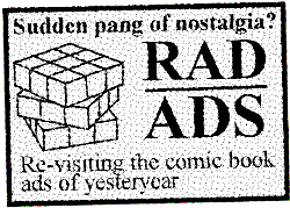 All tongue-in-cheek, of course, and a send-up of the comics biz. I meant this story to be a template for the possible series about Penalizer, which I never got around to writing and proposing. 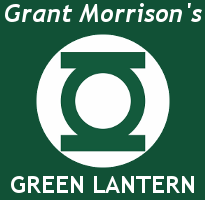 (Tom Peyer was definitely into the idea too.) We also learn how Decker shamelessly steals ideas from Cliff’s amateur submission, including the name of the villain, “Doctor Darkness”. 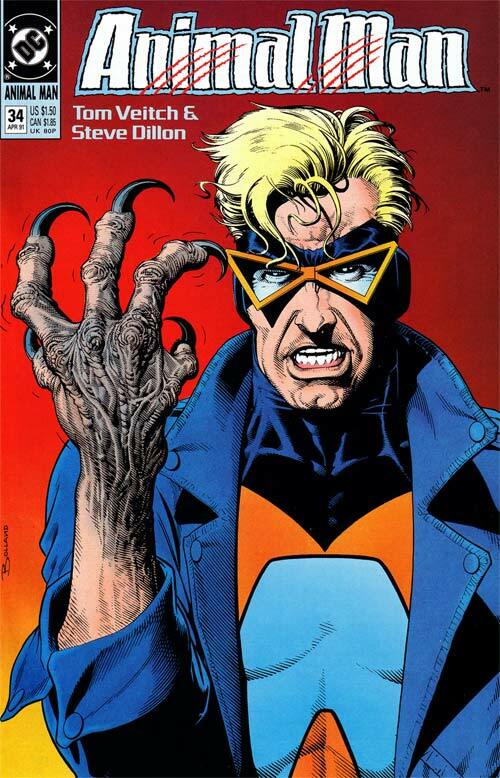 Last but not least, a new character is introduced – “the screenwriter” who will script a movie about Animal Man. Another send-up – this character is myself, based on photos I sent to Steve Dillon. 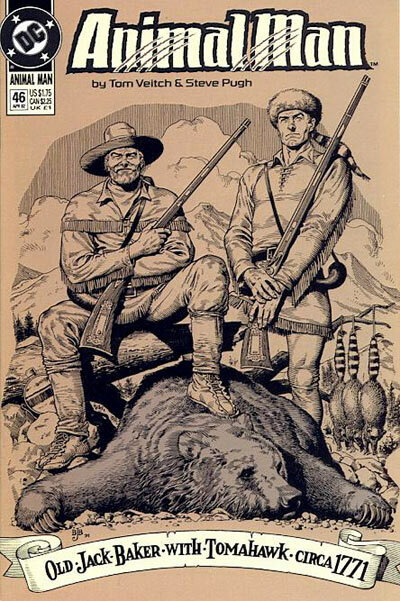 #46: "A Rage of Fathers"
With 1950s DC character Tomahawk on the cover. The art by Steve Pugh I find awesome. Here we learn that Buddy, as a youth, met old Stone, the shaman, while on a hunting trip with his father. He calls Stone “my real father” and together they find a giant metallic “cocoon” that contains Stone’s enemy, the Antagon. Maxine in the power of B’Wanna Beast. Great scene of Travis Cody in cyberspace, where he learns that Buck Samson is turning himself into a superhero by manipulating his DNA. B’Wanna Beast merges with Antagon and battles Animal Man. #48: "The Meaning of Flesh"
Rainey Fox, the movie director, gets fried by the Antagon. B’Wanna channels the Antagon: “I am sent forth from the unitary aeon … to bring judgment upon all that dares to live. I am the self-begotten, the source of incomprehensible undoing.” Then he takes a bite from an apple. …More Cody in cyberspace. Buck Samson’s hitman, Moonlight Jackson, kills Cody’s friend, the woman Kami. Sweat lodge scenes, Stone shows up to announce the coming battle between the Antagon and the Animal Masters. And then Stone takes his friends into the micro-universe to hide from the Antagon. #49: "The Hot Heart of Abstract Reality"
In the microworld we see that grotesque dust mites are the “guardians of the threshold” … Tristess, shamaness and Animal Master, says something that cuts to the core of Buddy’s search for himself – “A warrior must awaken to a true identity … an identity that cannot be contained in mirrors and costumes and names … Stone has been trying to get that across to you … you have failed nearly every step of the way.” This triggers something in Buddy, as he confront the gigantic dustmite: “I can feel everything going wide open … no fanfare, no explosions, no shouts of conquest … suddenly I am not focused in a body. Fear vanishes, my eyes open in the great vastness of the M-field … I am as wide as all the worlds, deep as the whole field of living energy from which all forms appear …” And so forth. If you read my other DC series, you will see this kind of awakening to “natural superman consciousness” is my main theme – in Clash, The Nazz, and My Name is Chaos. My plan was to do that with Superman himself, but as I recall editor Mike Carlin resisted the idea. Now Travis is dead, and trapped in cyberspace. 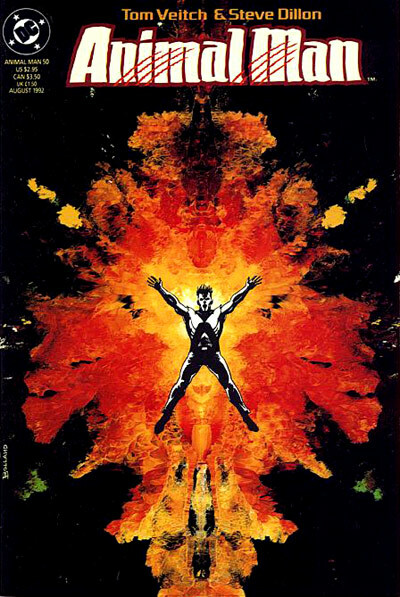 Buck Samson has had his own superhero apotheosis, awakening to the power of mind-over-matter and giving himself the name Metaman. “Metaman” is a character I invented for a comic my brother Rick was doing for DC. I decided to add substance to the name and reincarnated him here, in Animal Man, and I destroyed him as well. Now the Animal Masters gather in Labrador. Old Stone tells the story of the origin of the Antagon, who is a kind of anti-creator and annihilator … “even the anti-Christ”. The Animal Masters, on the other hand, are given the power to create animals! The struggle between the Animal Masters and the Antagon has been going on for millions of years! #50: "Journal of a Plague Year"
The whole 18-issue story is an impossibly vast yarn of light vs darkness, good vs evil, creation vs destruction … And it comes to a head is #50, a double-issue, with myself as a main character and voice-over. ELLEN: Buddy … please, just tell him to leave. 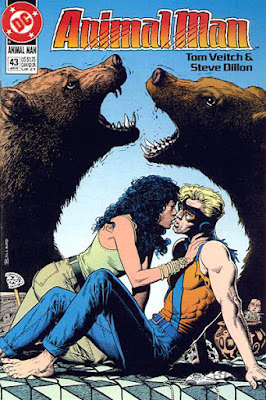 ANIMAL MAN: Right. Pack your toothbrush and get out of my life, creep! Veitch tries to get physical with A-Man, even kicks him in the balls. Next thing you know Veitch is sailing through a window and ending up face-down on the front lawn. ANIMAL MAN: Cheer up, pal. It could have been a lot worse. Now get up. You and I are going to be friends. 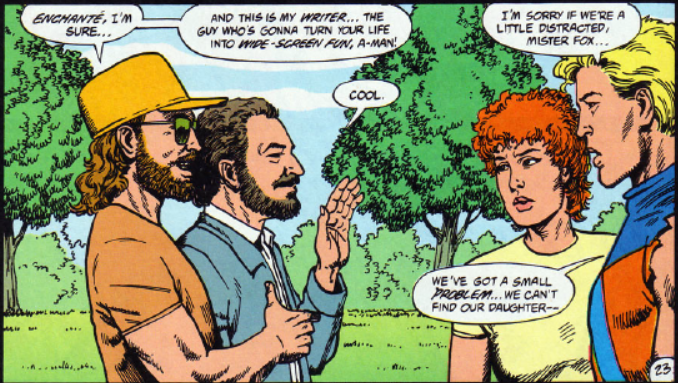 ANIMAL MAN: I’m still sort of ordinary, you know. But when I lay down at night and close my eyes I see the world … the animals … men … from a place that can’t actually be described … an uncreated place that’s not of time and space … I’m not alone there. There are others. Stone is there, living on… And then something dark surface in the well of thought … a feeling of great dread… I see him, the Antagon, the one who cannot be destroyed because he is destruction. He can only be contained. …For the moment he is our prisoner … but I sense he’ll find a way back into the world. He’ll take a new form, a new name. He’ll become something we don’t recognize, something we can’t control. 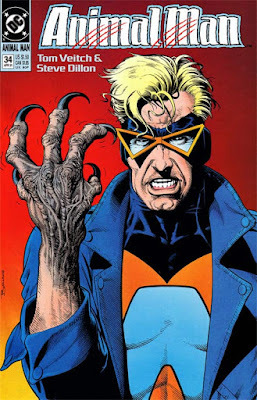 Again, a big thanks to Tom for sharing his notes on his Animal Man run -- which included a few items that I completely overlooked the first time.